When you read enough YA/teen dystopian novels as I do, or at least search for books in that general vicinity, you become familiar with the books around it. 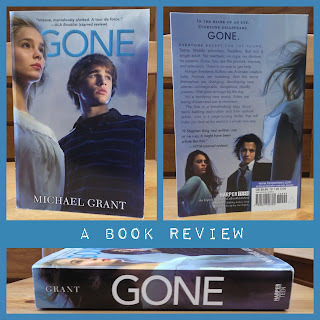 Gone is one of those books that I saw often but never picked up. I heard it was along the lines of a dystopian/apocalyptic society tale and that was enough to put it on my mental "to read" list. I've been slightly unsatisfied with the current dystopian series that I've started (Delirium and Matched) and was looking for something new to start and decided to finally pick this up. ~Fun fact: Michael Grant is married to Katherine Applegate, author of The One and Only Ivan, which I coincidentally also read this month. If you're curious about that book, you can find my book review for The One and Only Ivan here. Everyone except for the young. Teens. Middle schoolers. Toddlers. But not a single adult. No teachers, no cops, no doctors, no parents. Gone, too, are the phones, internet, and television. There is no way to get help. It's a terrifying new world. Sides are being chosen and war is imminent." Very The Lord of the Flies if you ask me, but more sci-fi-y. I took 2 weeks to read Gone. I started it the mid-February, but it was one of the last books I finished. I think it took me 1 weeks to read the first 25%, and after I reached that point, I just plowed through to the end. I thought the book started off slow. It does immediately begin with action, and the disappearance of everyone, but that quickly created an anti-climactic effect so early on in the novel that I found myself less than captivated early on. When something incredibly exciting starts right off at the beginning of a novel, you can only stay at that climactic state for so long. And I felt the beginning of Gone was trying to keep me at that height of dramatic event for so long it was exhausting. So I had to put it down repeatedly and read other stuff. However, the book quickly picked up the pace (about 25%) and I grew to love all the different perspectives and story lines the book provided. Very, very nice technique. It kept the story fresh and entertaining. My overall impression on the book is positive. I like how it revisited such a classic plot (Lord of the Flies). The world is different now than when Golding published Lord of the Flies in 1954 and I think Grant was really able to create a different situation with a classic plot nearly every literate person knows. The one thing I can think of that could have made this book better, was better villains (see "Characters" segment for more details) and better, more complex writing. There is a lot to say about characters, so I'm going to split up the good guys and the bad guys. I rather liked Sam, the protagonist. I find that readers are often most critical of the protagonists because we see so much of them and get disappointed if they're not exactly as we hope. I think Sam delivers as a protagonist. He is a very likeable character. Next is Astrid, the female lead. I didn't love Astrid in the beginning (she wasn't anything special), but she grew on me as the book went on. I felt like I liked her mostly due to her nurturing behavior towards her younger, autistic brother. My heart always warms to those parents who raise handicapped children, and Astrid earned respect from me because of this. Didn't love her, but I liked her enough. When I go into a book knowing that I want to review it (especially if it's a long one), I try to take notes as I go- just little things so I can remember if how I feel about something changes. And looking back on my notes, there was something I wrote repeatedly right from the start: I. Hate. Quinn. Quinn is Sam's best friend, and I kept waiting for something rabid to pop out and bite his head off. Quinn is whiny, annoying, insensitive, a little bit racist (seriously, one too many Mexican jokes), and I know he's a surfer, but does he need to say "brah" as every other word? The guy just came off as a complete douche even up to 50% of the book. After that, I got over it, but I never liked him at all. Because this book does have superhuman characters with powers, you expect "heroes" and "villains" to rise out of it. The superhero roles are filled nicely, but I didn't feel like the supervillains were that terrifying or complex. I found Caine one-dimension and boring. He's about as terrifying as a guy with mommy issues. Oh wait..And Drake. Drake was scarier than Caine, but also one dimensional. And by the end I still had no idea what "The Darkness" was (no worries- that's all I'm going to say about it). But honestly, after nearly 600 pages, I would've liked some sort of clue. Aside from the "villains," I think Grant creates a great cast of believable characters. (Albert was probably my favorite background character.) Also, the length of the book really allows you to see most of them. Stylistically, Gone is told from various third-person omniscient perspectives. The person you get the most of throughout is Sam, the protagonist. But some chapters shift to characters on tangent story lines, and even characters within Sam's circle. I like the shift A LOT. I want to emphasize that without this shift I probably would have grown tired of the story and would have taken longer than I already did to finish it. The writing wasn't entirely brilliant, so the different perspectives were nice. Last 50% of the book, I couldn't put it down. Of the teen dystopian series I have not finished (since I think it's unfair to rank completed & uncompleted ones together), I rank Gone below the Divergent Trilogy and above the Delirium Trilogy (with the Matched Trilogy far far below). Once you get pass the first 25% (and definitely pass the 50% mark) it really does move incredibly fast and you won't be able to put it down. I will definitely be keeping my eye on Hunger to read in the near future. I definitely recommend it if you're drawn to sci-fi/dystopian novels with a hint of teen drama.